The new Intel® Xeon® processor E5-2600 v3 family product helps IT address the growing demands placed on infrastructure, from supporting business growth to enabling new services faster, delivering new applications in the enterprise, technical computing, communications, storage, and cloud. This new generation of processors enables powerful, agile data centers by supporting a Software-Defined Infrastructure (SDI) to address the imminent need of greater flexibility with higher levels of automation and orchestration. In addition, the Intel Xeon Processor E5-2600 v3 product family delivers significant benefits in performance, power efficiency, virtualization, and security. Combining these benefits with a low total cost of ownership and Intel’s acclaimed product quality, the Intel Xeon Processor E5-2600 v3 product family is a compelling solution for any organization. The Intel Xeon Processor E5-2600 v3 product family adds 50 percent more cores and cache3 over the previous generation and includes numerous other hardware enhancements, such as Intel® Advanced Vector Extensions 2 (Intel® AVX2) and Intel® Quick Path Interconnect link (QPI). These innovations deliver up to 2.2X the performance over the previousgeneration to significantly boost output across a broad set of workloads. The Intel Xeon Processor E5-2600 v3 product family also delivers an increase in virtualization density of up to 1.6X compared to the previous generation,4 building on an ever more important capability in the data center. Higher performance for diverse workloads – With up to 18 cores per socket, 45 MB of last-level cache (LLC), and next generation DDR4 memory support, the Intel Xeon Processor E5-2600 v3 product family delivers significant performance improvements in workloads across all industries, from small businesses to large corporations in enterprise and technical computing, communications, storage, and private clouds. Up to 1.9X higher performance gains5 for enterprise workloads with Intel® AVX2 – Intel AVX2 with new Fused Multiply-Add (FMA) instructions in Intel Xeon Processor E5-2600 v3 product family doubles the floating point operations (Flops) from first generation Intel AVX, and doubles the width of vector integer instructions to 256 bits, expanding the benefits of Intel AVX2 into enterprise computing. Per-core P States – New per-core P states (PCPS) dynamically adapt and improve power for each core, resulting in optimized workload processing. The Non-Volatile Memory Express* (NVMe*) specification that is supported by the Intel® Solid-State Drive Data Center Family for PCIe overcomes SAS and SATA SSD performance limitations through an optimized register interface, command set, and feature set for PCI Express (PCIe*)-based Solid-State Drives (SSDs). Data protection and data center security is critical to all organizations. Intel’s hardware-enhanced security technologies on the Intel Xeon Processor E5-2600 v3 product family better protect data and platforms through workload isolation, security policy enforcement, and faster data encryption. Up to 2X faster encryption and decryption – Intel® Data Protection Technology with Intel® Advanced Encryption Standard New Instructions (Intel® AES-NI) accelerates data encryption and decryption up to 2X faster than previousgeneration Intel Xeon Processor E5 family. With many workloads, Intel AES-NI encryption and decryption is practically transparent to system resources. Combined with Intel Data Protection technology with Intel® Secure Key random number generation, Intel Xeon Processor E5 v3 family provides even stronger data protection. Strong protection against platform attacks – Intel® Platform Protection Technology with Intel® OS Guard and BIOS Guard traps external calls trying to hijack System Management Mode (SMM) code in the OS, and provides workstation BIOS protection during FLASH updates via protected agent authentication. Intel® Platform Protection Technology – with Intel®Trusted Execution Technology (Intel® TXT) helps protect platform firmware and the OS kernel from pre-boot attacks. TXT now supports Trusted Platform Module 2.0 (TPM 2.0) with stronger cryptographic capabilities. With the growth of private and hybrid clouds in the enterprise and with increasing demand for services, IT seeks higher efficiencies in orchestration, data center management, and virtualization on a path toward a Software-Defined Infrastructure (SDI). The Intel Xeon Processor E5-2600 v3 family brings several innovations, such as Intel® Node Manager 3.0 to help IT deliver greater levels of efficiency, while responding faster to business needs. Other key innovations that will have significant impact on streamlining data centers and extending efficiency and performance include DDR4 and Intel® Ethernet Controller XL710 Series. Up to 1.4X higher memory bandwidth9 – DDR4 nextgeneration memory technology improves platform performance on memory intensive workloads with up to 1.4X higher bandwidth versus previous-generation platforms. Adopting DDR4 enables solutions to meet data center energy efficiency requirements. Infrastructure utilization – Cache monitoring allows realtime, high-confidence measurements of LLC usage, providing control of workload placement and load balancing across shared infrastructure in the virtualized environment. 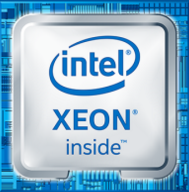 Intel® Xeon Phi™ Coprocessor – Based on Intel® Many Integrated Core (Intel® MIC) architecture, the Intel Xeon Phi coprocessor delivers leading performance for highly parallel workloads. The Intel® Ethernet Controller XL710 Series – Delivers proven 10 and 40 Gigabit Ethernet connectivity for the platform, extending Intel® Virtualization technologies beyond server virtualization to network virtualization. Intel® Solid-State Drive Data Center Family for PCIe* – Built on the NVMe* specification, the comprehensive product family of 2.5-inch and Add-In-Card form-factors delivers breakthrough performance, optimized for real-world applications. Storage Related Software – Intel® Cache Acceleration Software (Intel® CAS) is server software that caches the most active data on SSDs, providing application acceleration at low cost. Intel® Rapid Storage Technology Enterprise (Intel® RSTe) is software that provides easy-to-use, enterprise-class data protection. Intel® Communication Chipset Series 8900 – Highlights Intel® QuickAssist Technology and delivers hardware, encryption, compression, and acceleration for networking and storage workloads. Intel Data Center Software – Intel Data Center Manager (Intel® DCM) and other Intel software give IT a broad set of data center tools to help stay competitive and take advantage of Intel hardware. Download the Intel Xeon E5 2600 v3 Family Product Brief (PDF). CPGuard.com is a division of Virtual Graffiti Inc, an authorized Intel reseller.